There are periods in history when man takes giant leaps, rather than simple strides. The 1960s were just such a time. President Kennedy had commanded that America should put a man on the moon by the end of the decade. And so the Apollo missions started their fiery ascents in their quest to deliver that dream. Down on earth things were hotting up too. The need for speed had well and truly arrived with four contenders battling for Land Speed Record honours. Donald Campbell’s jet propelled, wheel driven Bluebird set the pace in 1964 with a run of 403mph in Lake Eyrie, Australia. This was then eclipsed repeatedly by a trio of battling Americans riding rocket propelled projectiles, culminating in Craig Breedlove’s Spirit of America blasting across the line on the Bonneville flats at just short of 600mph in 1965. While things were hotting up on four wheels, things on two wheels were getting interesting too. A Triumph motorcycle dealer and racer by the name of Bob Leppan had built his own streamliner together with ace engine builder and chief mechanic Jim Bruflodt. A chance encounter with advanced car designer Alex Tremulis sparked an interest in their efforts that was to culminate in the creation of the futuristic sounding Gyronaut X-1. that’s mighty quick on two wheels with a contact patch smaller than the soles on your shoes. The rest as they say is history. 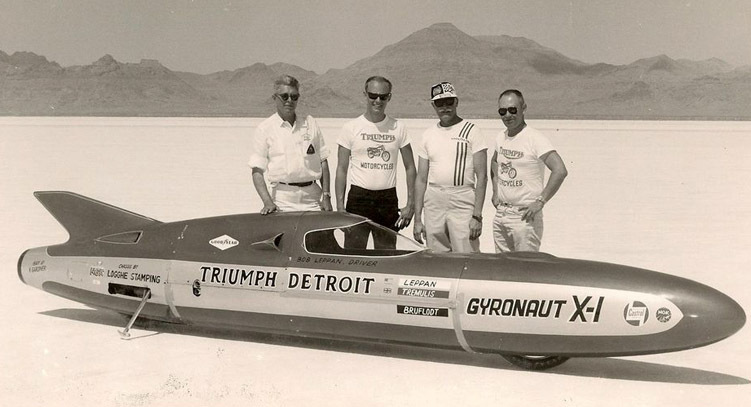 After two years development, in 1966 Bob blazed across Bonneville to set a Motorcycle Land Speed Record of 245.667mph that would stand unbroken until 1970. 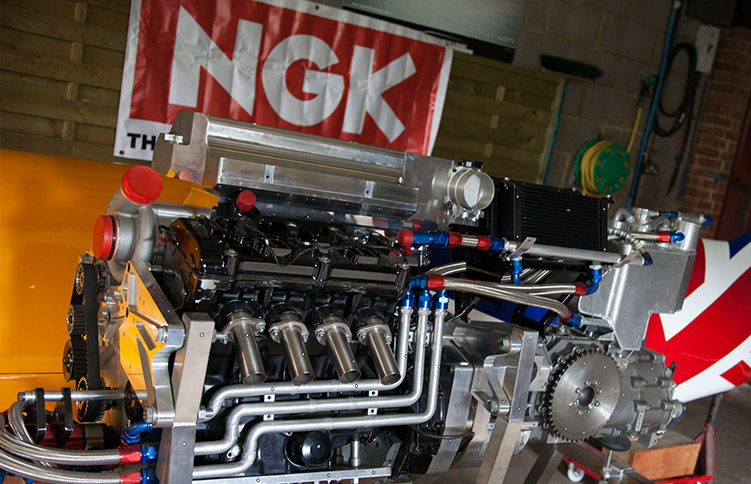 A record sparked we’re pleased to say was sparked by NGK. Fast forward fifty years to 2016 and the competition on two wheels has moved on, the speeds have risen, the record currently standing at 376mph to American Rocky Robinson. As you can see from below, that’s mighty quick on two wheels with a contact patch smaller than the soles on your shoes (fast forward to around the two minute mark and you can really see how fast 376 miles an hour looks from the outside). Interestingly though, while the speeds have increased, bike design hasn’t made the same advances. A look around the many contenders will reveal underpinnings that are a lot older than their outer skins might suggest. In fact many of today’s bikes are based on designs that are 20 years old or more. And maybe that’s not surprising. First off they weren’t cheap to build. Secondly they don’t exactly get a lot of use as the runs are only around 10 miles long. So in terms of wear and tear, the temptation is naturally to stick with what you know and wind up the wick on the engine. Indeed the current record has already been exceeded, but no one has managed to repeat the run within in the allotted time, hence the record remains unbeaten. But with the 400mph barrier so tantalisingly close, the riders and runners are now coming from all directions. Maybe as many as eight in total and from as far away as Australia. Some still running updated models, others newbuilds. But we’ve got our eye on one in particular. A certain Angelic Bulldog. Ridden by Yorkshireman Gabriel Uttley. Gabriel is well known to the Bonneville boys. Having run in lower classes, he has provenance. The fact he’s competed on the Isle of Man adds to it. And like any group who spend part of their lives in high risk endeavour, there a special cameraderie. But perhaps what they like even more is that he is a trier. That he goes his own way. And has been doing so for almost twenty years. You see Gabriel’s LSR project has been something of a slow burning fuse because of his singular approach and the lack of access to the big budgets US record chasers seem to be able to attract. The pursuit of excellence and scarcity of funds has led him and his team of volunteers to design from scratch almost every component. This approach is exemplified by the unique powerplant, designed by an ex F1 engine designer Dan Dole, that sits at the heart of the Bulldog. The Dan Tec engine is an offset square 8, with twin cranks to a common shaft. One block is turned 90 degrees and the other 270 so that they run as they were designed to in the Honda motorcycle. They are geared together to the shaft. The shaft output has been geared up from 10,500 rpm to 12,500 at the inlet to get the gears right. The supercharger is a Rotrex C38-91 from Denmark. The gearbox is made by Elite at Stoke. It is an XL250 with completely different internals, made specially with spool shafts instead of a diff so that it can run twin watercooled chains to the rear wheel. It’s worth while remembering that at 400mph you’re covering the length of two football pitches every second and with the run up to top speed taking around five miles, you get a feeling for the sensitivity required from throttle and steering inputs. Pedal to the metal it isn’t. As we approach the 50th anniversary of Bob Leppan’s world record, sparked by NGK, you can guess who we are pinning our hopes on to break the Motorcycle Land Speed record. And after almost 20 years waiting, what’s another few months either way between friends? 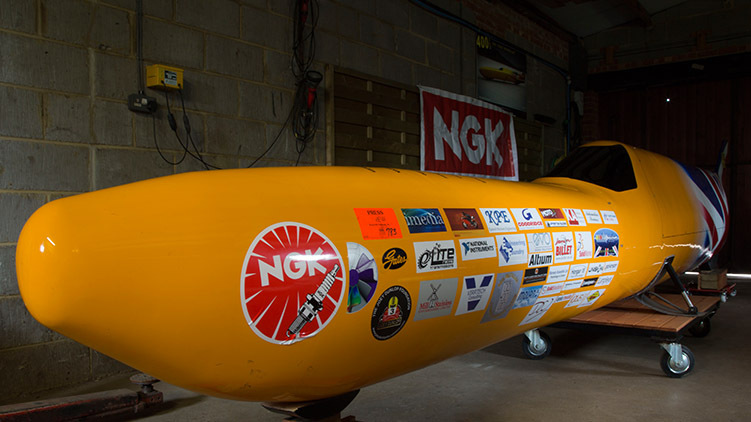 For news on the Angelic Bulldog record attempt, visit their website.